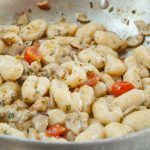 Ndunderi is an ancient Italian dish from the Amalfi coast, very similar to gnocchi. I had it for the first time on my first visit to Ravello at the Hotel Villa Maria at the suggestion of the owner Vincenzo Palumbo. I loved it! My enthusiasm must have been obvious because he invited me to come to a cooking class the next day at the hotel where they were making them. The regular translator was ill. So I stepped up, which was a ball and I learned how to make these! It was the beginning of a crazy friendship with Vincenzo! It’s important to make sure that your ricotta is dry. If its watery, line a colander with cheesecloth, put the ricotta in and rest the whole thing over a bowl. Let it drain overnight in the fridge. 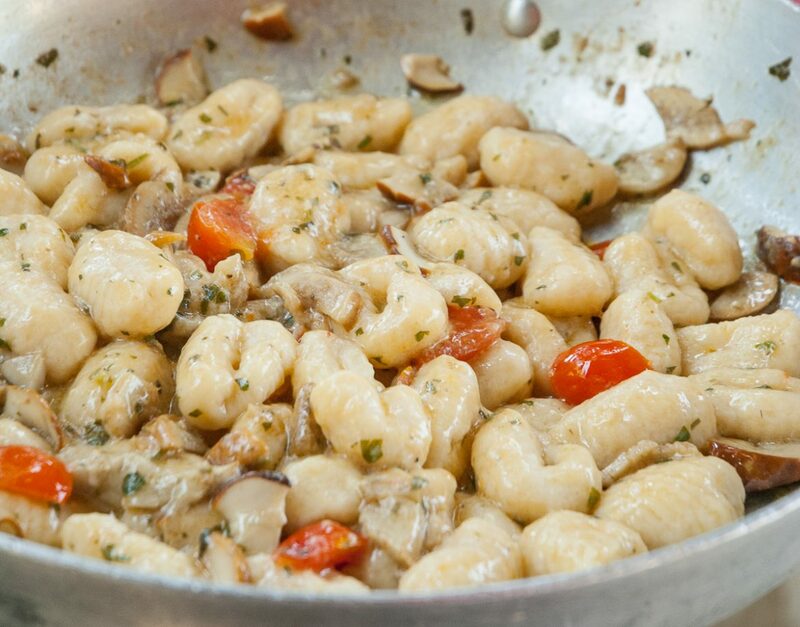 If the ricotta is too moist, you’ll have to add more flour which will make your ndunderi too heavy. Put all the dough ingredients in a bowl and get your hands in there and mix it all together until it forms a soft dough. Grab a handful of the dough and roll it into a log about an inch thick. Cut it into pieces about an inch long. These are your ndunderi. Take each piece and with your thumb lightly press and roll them down the back of a fork or against a cheese grater to create ridges. Bring water to a boil, add salt, put your ndunderi in and cook until they rise to the surface, about 10 minutes. Drain well and add to your sauce. Heat up olive oil in a frying pan. Put in the garlic and olive oil and fry until golden. Add the mushrooms and saute for a few more minutes. Then add the white wine, tomatoes and parsley. Give it a good mix and let it simmer for about five minutes. Add the ndunderi to the sauce and gently mix to incorporate. Heat it through for no more than a minute. Remove from the heat and sprinkle with parmigiano.